Ian Morley, one of the pioneers of the hedge fund industry, takes no prisoners in his series of 50 Morley’s laws offering an entertaining analysis of the often absurd world of business and finance. Drawing upon his thirty-five years of experience, within the various financial sectors, Ian Morley successfully exposes the falsehoods and arrogances of the world of financial business and fund management. Tackling questions like, “Do you know why transparency is a bit like virginity?” Morley provides insightful home truths with humour, honesty and a heavy dose of all-too-uncommon common sense. 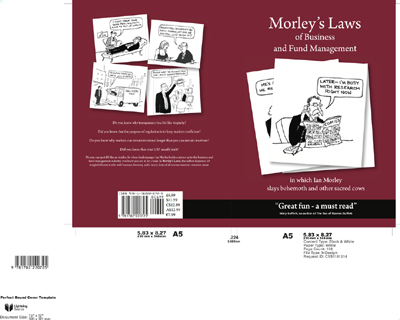 Capitalising on an intriguing economic climate, Ian Morley holds up a mirror to the business of fund management dispensing 50 insightful laws each supported by a humorous cartoon, by a former Private Eye illustrator. Striking a perfect balance between the profound and tongue in cheek Morley tackles subjects from pension funds to the law of leverage successfully rounding up and cutting through the pomposity of these financial sectors. Taken independently or as a cohesive collection Morley’s Laws offers up the perfect opportunity for both financial industry professionals and those with a keen curiosity, to learn a new side to the industry and be entertained at the same time. 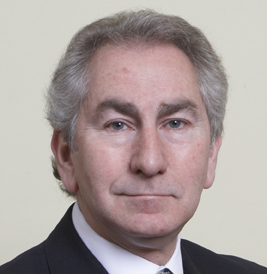 About the author: Global financial entrepreneur, Chairman of Wentworth Hall Consultancy and acclaimed speaker on the financial conference circuit Ian Morley is internationally acknowledged as one of the leading global figures and pioneers in the development of the hedge fund industry. Widely respected as a specialist in his field, he has had articles previously published in The London Times and Financial Times with appearances on Sky, CNN and CNBC. In addition, he is a member of Gray’s Inn and one of the select fund managers to be accredited as a journalist. During his spare time Ian holds a plethora of interests and when he’s not adding yet another marathon to his basket of 16 international and 150 half marathons you’ll find him at his home in London with his dog, two cats and sometimes his children. Morley’s Laws of Business and Fund Management (published by Paragon Publishing, RRP £6.99 paperback) is available online at retailers including amazon.com and can be ordered from all good bookstores.